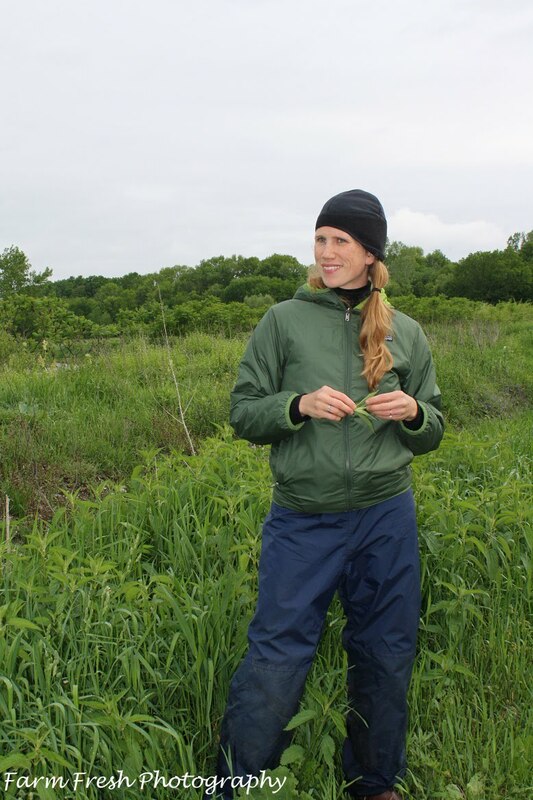 Lisa Rose is a backyard herbalist who is teaching classes at our CSA, Trillium Haven Farm. 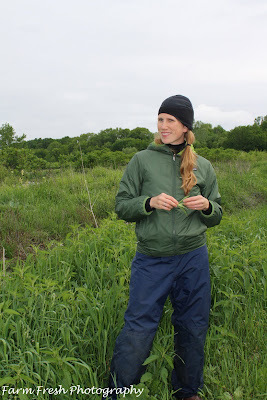 She is doing 5 once-a-month walks thru the wild areas of the farm starting last week. I had no idea what went on beyond the farms pristine gardens! It's called Stinging Nettle for a reason...ouch. very carefully following her instructions...we all tried it. Tasty! Kind of reminded me of a fresh green bean. DO NOT FORAGE FOR NETTLES ALONG THE DITCH. THIS is why we were never, ever to forage for nettles along the ditch....cause THIS was lurking. And tho nettles and hemlock don't look anything alike, you could easily reach down to pick some nettles and not see one of the smaller poison hemlocks growing right next to them. Do not touch, bruise, or otherwise go near this bad boy. Tasty, bitter green...perfect pick-me-up after a winter of heavy stews and soups. Pick the entire plant...pull it out root and all. The stuff is invasive so no worries...there will be plenty for next year! Remember sucking the "honey" out of the tiny flower? Lisa Rose will harvest the flowers and put them in honey to flavor it. 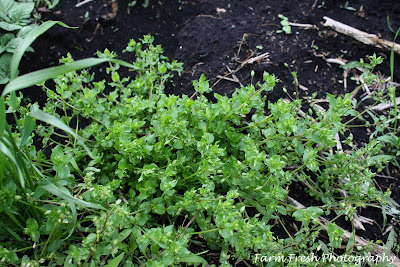 This stuff is everywhere in my perennial beds in the spring. Lisa Rose uses olive oil and chickweed as the base for a salve that she makes. 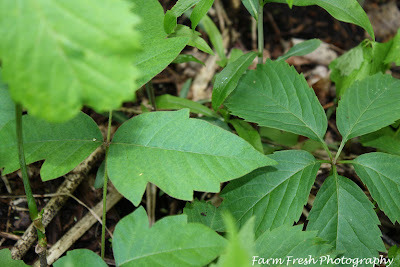 I am very excited to go back the end of June to see what else is growing wild at the farm. Not certain I want to throw out my Neosporin quite yet, but I am very curious as to how these herbs and weeds fit into an organic lifestyle. 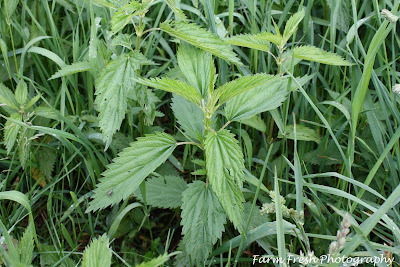 For now tho I am quite comfortable going to the farm and foraging stinging nettles (away from the ditch!) for a pot of tea, and garlic mustard for my wild(er) salad! Are YOU a weed eater? I kill off dandelions and a flower weed we just can't get rid of - it kills other weeds it grows so fast! I was very excited about collecting nettle and some of these plants until I read about the hemlock!! I'm one of those gals who is sure I'll even TOUCH the thing that I won't go near the ditches. But why ditches in particular? And is this plant really poisonous just to touch? @Amy: Not sure if it is in EVERY ditch, just the ditch around our CSA farm! 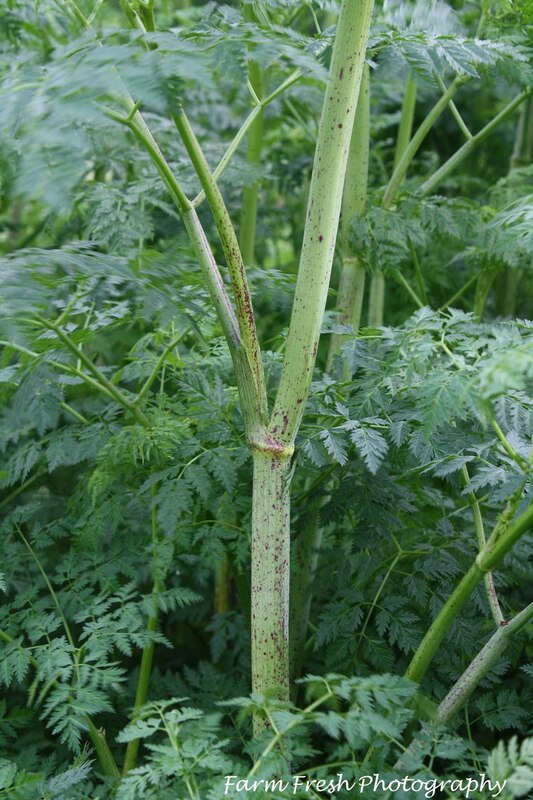 I did look up Poison Hemlock, and it can be deadly. Not sure if just touching it will kill ya dead, but when Lisa Rose is dealing with 9 VERY ignorant gals, she's probably not taking any chances! @Blessed Rain: We have plenty of dandelions, and thankfully are not allergic. All of our yard is basically just weeds, we just treat it as if it were grass and mow it! Oh, I wish we had something like this near us. I think it is fascinating, but I am too dumb to tell the difference in many plants. I have wanted to make something from Elderberry but I think there are two kinds ~ a good one and a bad one and I don't know the difference so wont touch either! I am also so happy that I am able to comment ~ Blogger hasn't let me in weeks! no weed eating here ... Don used to smoke it tho! I make a similar salve using Plantain and comfrey. We eat wild onions/garlic, dandelion greens in the spring, lambs quarters, use sumac berries (not poison sumac!) to make a drink that will cure mouth sores, violet jelly, batter dipped and fried daylillies... probably others I'm not remembering right now. It's so fun. Thanks for this post! p.s. What did she do to make the nettles safe to eat? @ Loves2spin....she takes a leaf, folds it over on itself, again and again till it is a tiny bundle in your fingers! If you dry it then crush it for tea it no longer stings. Also if you stir fry it...no sting! wasn't this class so intriguing! And, your photos turned out beautifully. 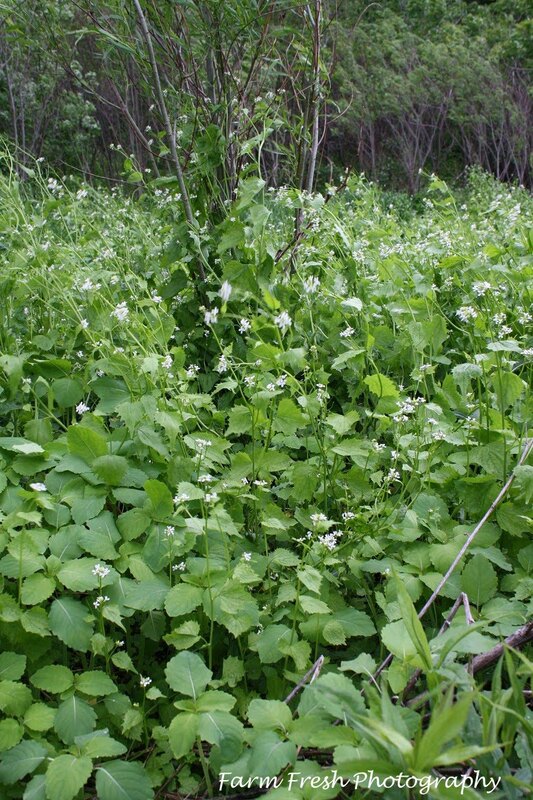 I'm not sure I could recognize the garlic mustard without the flowers so hoping they're still in bloom when I get out there to pick some. Let me know if you want to head out! My grandmother used to make my father pull the car over so that she could pick something that looked like dandelion greens... They may have been or perhaps wild growing chicory. She made the best salad with it... the olive oil, vinegar and salt made it pop! I just LOVE honeysuckle. 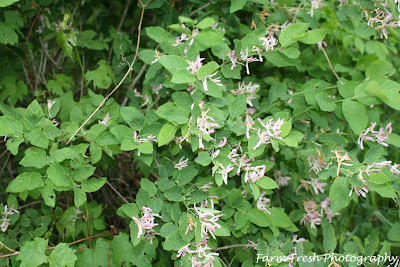 It grows wild along my house and I can smell it through the walls! This stuff really intrigues me! I've posted about the Garlic Mustard ("Mystery Weed"), which grows in my back yard. I also have Stinging Nettle, which grows in my original raised bed. Like your other commenter, loves2spin, I want to make a salve with the plantain that grows in my yard. 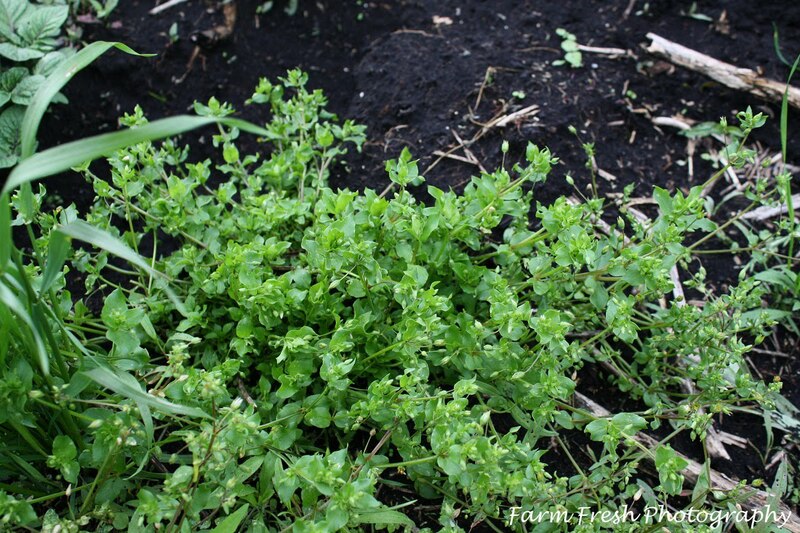 I love to discover these edible and medicinal plants that some people call "weeds"! Great post and wonderful pictures!